Enhance your product's appeal with Reynolon PVC shrink films' strength and durability combined with sparkling clarity and high gloss! Shrink wrap is a shipper's friend. It holds tightly to whatever product it wraps, it's clear and glossy to give a professional look, and though it is thin it has a high level of durability. 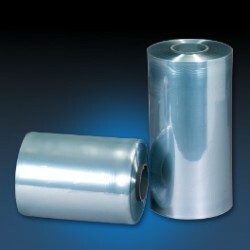 It makes for a popular item to wrap toys, compact discs, stationery and certain food products. It gets its name "shrink" from the characteristic that it shrinks to conform to the shape of the product it's wrapping just with the adding of a little heat. If you have non-food items to ship or store, then PVC shrink film is a good option. It's strong, durable and wrinkle-free. These shrink rolls come in all-purpose 50 and 100-gauge weights. This shrink film is approved packing material by the U.S. Postal Service, so you can trust that it will hold up to freight travels and keep your item wrapped and protected. Check out our inventory and make sure you have plenty on hand for your product- or package-shipping needs.